Since moving to Toronto, I've always lived on or within a block of Sherbourne Street. From St. Jamestown to Moss Park to St. Lawrence area, I've always been somewhere along Sherbourne St. south of Bloor / north of Lakeshore. My feeling was that there wasn't really a cute little cafe near Sherbourne along that stretch where I could pop in and do work or chill. Basically it seemed (to me anyway) you'd have to go further into Cabbagetown to find such a place. 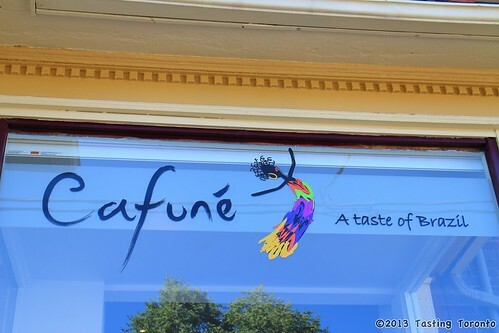 Cafuné, an Afro-Brazilian cafe, is on the outer edge of Cabbagetown near Sherbourne and Carlton, and it has somewhat filled the "cafe void" I always felt Sherbourne had. I could see myself kicking back there with a coffee and my iPad or a good book (in fact, they have Brazilian classics translated to English on a bookshelf and they encourage you to get your read on. Cute!) Speaking of coffee, their Brazilian "Moreno Blend" coffee is out of this world - it's rich and flavourful and you can get a cup there or buy beans to take home, either ground on the spot or whole (conical burr grinder owners, rejoice!) We bought a bag and, while it's $9.00 for 400g, you really get what you pay for in quality - price be damned, it's worth it A) because, as I said, it's delicious and B) when you know what the owners had to go through to get the coffee here, you're appreciative enough to pay that price. They have relationships with coffee growers there and are importing this stuff themselves from a small microregion in the Southeast mountains of Brazil, with altitudes between 3000 - 5000 feet. The farms are committed to sustainable standards regarding the preservation of the local ecosystem and quality of life for the workers, and Cafuné's owners even visit the farms and do a personal quality assurance check. The other drink of choice is of course the Capirinha, Brazil's national drink made from some sugar, lime and their hard liquor called cachaça, which is made from sugar cane. 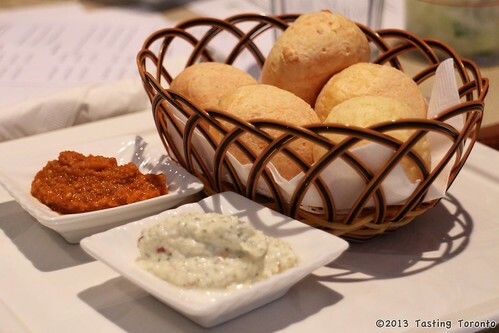 We highly recommend grabbing some Pão de Queijo for the table to share - crunchy on the outside, warm and soft on the inside - true comfort food. This appetizer has an interesting backstory: Early in Brazilian history, during the production of manioc (cassava) flour, the roots were peeled, grated and soaked in water inside wood bowls. Then it was spread outdoors to dry in the sun. However, a white powder was left in the bowls, and workers scraped off this powder to form and bake these little balls. Over 200 years later, as cattle farms became more common there and workers gained access to milk and cheese, these ingredients were added to the mix. While African and Brazilian influences flavour the menu most, there is also the occasional Italian and Lebanese contribution to the menu - I had learned that night that Brazil has a sizeable Italian and Lebanese community which I had no idea about - very cool & very diverse! Penderita Kolesterol? Hindari 4 Jenis Makanan Ini!